Chocolate for breakfast? No need to feel guilty about it with this nutritious yet decadent granola. The grains are lightly sweetened with honey and molasses and are full of fiber, healthy fats, and protein. The thick, earthy molasses brings out the chocolatey flavor of the cocoa powder and helps the granola to form the chunky clusters that we all love. Using a combination of rolled oats, coconut flakes and toasted nuts as the base provides tons of different textures. Serve with yogurt and berries for a sweet breakfast treat or nutrient-rich afternoon snack. Keep this granola on hand to satisfy late-night chocolate cravings. Snack on it by itself, or try letting it soak in almond milk for a few minutes for a candy-like treat. You could even serve it over vanilla ice cream or frozen yogurt for an indulgent dessert! Per Serving: 477 calories; 25g fat; 57.5g carbohydrates; 9g protein; 0mg cholesterol; 227mg sodium. Needed a quick and easy snack to take on a day trip to a festival that was going to have us out of the house all day. With one child saddled with far too many allergies, store-bought granola is often a dice roll, so it's not worth it when you can make it so easily. This made a nice-sized batch that kept the kids snacking all day and avoiding the behavioral issues that come with sudden-onset hunger. BIG WIN! Yum, I have always loved making Ina Garten's hazelnut granola but I figured I'd switch it up and try something very different. 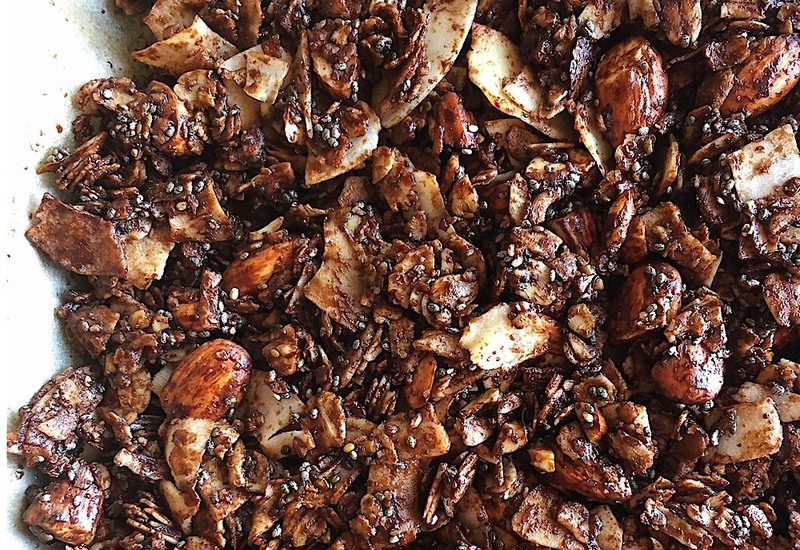 This chocolate and coconut packed granola is OUT OF THIS WORLD good. Will definitely make it into my regular rotation. I was excited to make this one for a healthy snack to keep around the house. It turned out pretty good but next time around I'll probably up the honey a little bit, as I prefer a sweeter taste to it. These are my guilty pleasure. Eating chocolate for breakfast? Why not! These help me get through my craving for chocolate, without splurging on candy bars and junk food. I'm always looking for new ways to switch up my granola making addiction. This recipe is fantastic. When the granola cools, they crunch up nicely. These are great to bag up for snacks, and to top on vanilla yogurt. For the nuts I did just almonds, but next time I'll probably add pecans.